1 MB RAM, 2GHz Intel or AMD processor, Sound card, 700MB Free Space for the sound library, Dual Core recommended, Display at least 1280 x 1024 recommended. 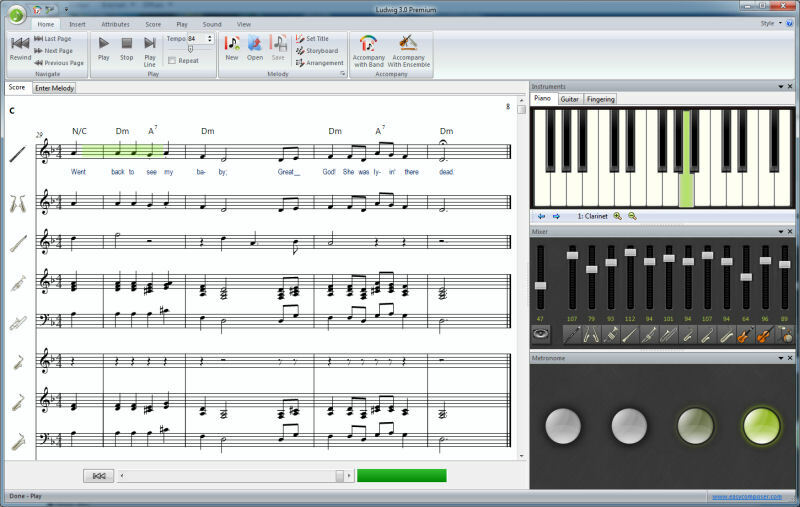 Ludwig is a songwriting tool that creates band arrangements for melodies or songs. Ludwig uses artificial intelligence to write arrangements note per note, instead of relying on prearranged material. Ludwig mimics how a human creates band arrangements. Ludwig tries to fit the arranged parts to a melody which leads to a more organic and less repetitive music than pattern-based band automats. Ludwig can create arrangements for a variety of small ensembles including string quartet, four-part choir, recorder trios, brass quintets and many more. To use, simply enter the notes of the melodies and lyrics in notation or simply play them via MIDI controller. Ludwig can display the full score of the band or orchestra arrangement once its done and can do MIDI Im/Export and MP3-rendering, as well as MusicXML Export. Ludwig can be better ! Posted by Anonymous on Tue, 04/16/2013 - 01:58. Great software,easy to use in most ways. Very interesting compositional aid,however many flaws in functionality that hinder progressive steps. Ok,firstly. The crashing issue,I lost a lot of pieces due to crashing under win 7 (64bit) maybe it's the OS,maybe not. It's irritating though,trying to save a song or trying to add a band style to a melody then the software simply crashes with an annoying error report. Then all your work is gone. A list of issues are below. Ludwig compositions - Song selection is not fully controllable by user,on selection of the next song using the skip button seems to make the selector suddenly jump to a random song or back to the top. Score deletion does not seem to work right,Ludwig presents a tedious routine to get rid of elements. A simple one click deletion might do the trick! Metronome- it would be nice to be able to disable the metronome completely in every mode,its a waste time if someone is trying to audition ideas. An option to ignore the metronome might be helpful to some users. An easier style creator- if this is possible,you then would have so much more variety and input from many more categories of users. Note input-Might be more useful for users ludwig to record the notes as played on input by mouse on the keyboard GUI rather than repeat the same notes that is currently displayed at that point on a particular bar, that would compensate for the lack of a decent midi controller input function. Sometimes in review of a score the notes get shifted accidentally too easily. Score scroll could be improved,more interactivity needed.